type of record keeping book that is needed. have been living the dream for a few years. P. S. If you post as “Anonymous,” you are not eligible. Sorry, but I still can’t read minds. Would love to win and give this book to myself. I have chickens and love to can but need some help with growing my own food. My 8 year old grandson loves to garden so we would share all the wonderful knowledge with each other. Thanks so much for your blog and books! 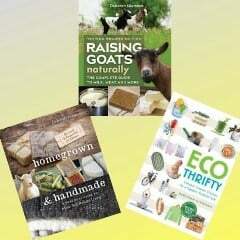 I was hoping to win the eco thrifty book for my parents, but this book might be even better! They've already got a small summer garden down and 2 egg laying chickens, but they could use all the help they can get! I've been trying to convince my sister to make some changes to become more sustainable. I know I got some excellent tips from your book. I'm sure if she had it to refer to, she would be ready to make changes for a more sustainable lifestyle. Would love to win this book as a gift for my coworker. She and her sister are interested jn moving to northern Wisconsin in a few years and starting a small homestead. Thanks!! My friend Amy, because she is my gardener that I go to for advice. Would love to be able to give her something for all the gardening help she has given me. I'd like to give this to my friend, Kari. I've convinced her to take a Food Leadership program with me – and this would be an awesome thank you! I would give the book to my husband for all his hard work on our house in progress. We are building a solar home (going on 3 years now,doing the majority of the work ourselves) Planning on having chickens, the organic garden, the whole nine yards in the near future! I would give them to my fiance. We just bought a house together and are planning out our little urban homestead. I think this would be the perfect gift to myself, since we aren't exchanging gifts this year! I would give this to my husband to help persuade him that we can raise chickens and live more sustainably! We hope to retire within the next ten years and start a small homestead and I think the information would be invaluable! I'd like to give this book and journal to my daughters, who inspire me to me to be more sustainable daily. They remind me to reduce, reuse, recycle and conserve our resources. My job as a parent is to encourage their interest and these books would help me to do that. Thank you for having this give-away. I would love this book for myself! I'm always looking for new ways to be self sufficient and it's extremely hard when you live in crowded new york! I would love to give one to my friend Sharon Adams. She and her husband have just bought 7 acres to try and be more sustainable. To my son Nathan. He has started a large community garden and next year hopes to be ready to make a career change to organic farming. My sister Pam, because she is wanting to become more self reliant. I also one of these days want to get this book for myself. My sister-in-law with 4 kids. They just moved onto 8-acres to homestead, home school and raise their kids with good country air, modesty and common $en$e. They are great learners and teachers and it would be great to glean from them what they learn from this book. I would really like to win this book for my sister. She is always growing new foods and trying to be more agricultural. She has chickens that lay their own eggs and I know she would love this book. My wife would love this book. We've been moving our little house toward sustainability, but often I don't have great reading resources to get her on board with my changes. This would be a perfect way to both get on the same page and chronicle whet I/we are doing. This would be wonderful book for my sister who is convinced I am a troublemaker. A year and a half ago, I took real eggs to her and since then her son will only eat farm fresh. One night via telephone, I convinced her to make noodles; now they only eat fresh pasta. More recently, after me telling her the virtues of raw milk, she has switched and is even making cheese (currently has cheddar in the fridge). 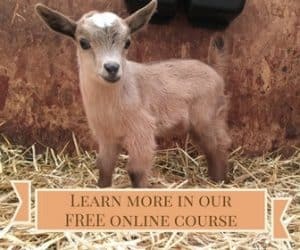 Next fall, I will have young Nigerian Dwarf goats that will need a new home; she currently says not to talk to her about goats but I am suspecting she might actually be ready for some then. If she were to have a copy of this book, she would undoubtedly know what a trouble maker I am, that we all are, and will move even closer to sustainability. I am very proud for her for moving toward the good side of life, step by step. Thanks to everyone for entering! I really enjoyed reading your stories! 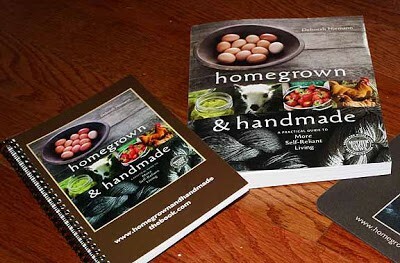 The winner is Gary, who is planning to give the book to his son Nate, who is planning to start his own organic farm. Gary, drop me an email — deborah (at) antiquity oaks (dot) com — with Nate's snail mail address, and I'll send him the book and journal.